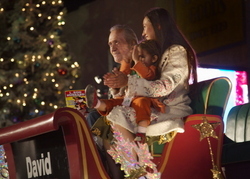 World-renowned actor David Carradine, daughter Phoenix, and grand-daughter Kansas leads the L. Ron Hubbard Stories from the Golden Age float along Sunset and Hollywood Boulevards Sunday night during the 80th annual Hollywood Santa Parade. Everyone was here to see Santa and hear the musical bands, but David and our costumed characters made everyone smile. A record crowd of an estimated half-million well-wishers greeted acting legend David Carradine and two dozen costumed actors riding the L. Ron Hubbard Stories from the Golden Age float Sunday night as part of the annual Hollywood Santa Parade 2008. Carradine (Kung Fu, Kill Bill, Golden Boys) with daughter Kansas and granddaughter Phoenix were joined by upcoming star Cassandra Hepburn (Hellride, The Stand) and Amrapali Ambegaokar (soloist on NBC's upcoming Superstars of Dance) aboard the colorful, glittering 30-foot long float along the 2-1/2 mile parade route up and down Sunset and Hollywood Boulevards. Audiences were treated to cowboys, detectives, maidens, and seductresses showcasing characters from 8 different story genres found in the newly-released Stories from the Golden Age pulp fiction series (Galaxy Press, 2008). "The crowd was wowed!" said John Goodwin, president of the Hollywood-based publishing house. "Everyone was here to see Santa and hear the musical bands, but David and our costumed characters made everyone smile." "It's great to see the joy in people's faces along the parade route," said Carradine. "Hollywood's past is based a lot on pulp fiction stories, so it's a perfect fit for the parade." Stories from the Golden Age is an 80-novel, 150-story series of trade paperback and multi-cast, unabridged audiobooks showcasing author L. Ron Hubbard's pulp fiction masterpieces from the 1930s and 1940s in multiple genres. The book and audio book collection is one of the largest known releases of pulp fiction novels ever published by a single author and publisher. In addition to his float appearance, Carradine is taking part in live theatrical readings of the Stories from the Golden Age stories. The performances take place every Saturday at the 200-seat Author Services theater located at Hollywood & Sycamore, just one block west of the famed Grauman's Chinese Theatre. The Hollywood Santa Parade was sponsored by the City of Los Angeles. The first Hollywood parade first took place 80 years ago, in 1928 and was called the Santa Claus Lane Parade. Carradine enjoyed the opportunity to spread a little Christmas cheer in his own home town. The native Southern Californian was born in Hollywood, the eldest son of actor John Carradine. For more information on the new line of Golden Age Stories books, go to http://www.goldenagestories.com or http://www.galaxypress.com. For more information on the Hollywood Santa Parade, go to http://www.hollywoodsantaparade.com.